As entertainment director on Queen Mary 2 Joanna Haley is in charge of the entertainment and activities presented to the guests. While often seen introducing the shows and on the onboard television, she is not just a master of ceremonies. The administrative aspect of the job involves scheduling the entertainment as well as supervising the activities staff, the ship's musicians and backstage personnel. Accordingly, Queen Mary 2 has a more extensive entertainment program than most other ships. On a typical voyage, QM2 will have production shows and shows by visiting comedians, magicians and/or singers. But it will also have classical recitals, performances by the ship's resident troupe from the Royal Academy of Dramatic Arts, ballroom dancing and live music by its 24 staff musicians. There are movies about astronomy in the ship's planetarium as well as cinematic productions. 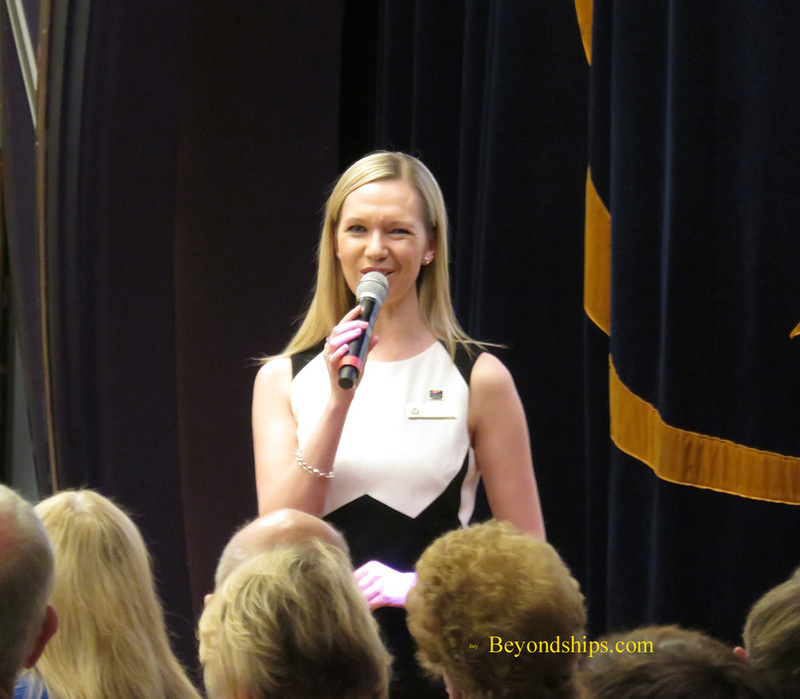 For enrichment, there is usually a celebrity speaker and lectures by scientists, authors, historians and others as part of the Cunard Insights program. Beyond the regular entertainment offerings, there is also special programs that are presented once a year or perhaps only once. Some examples include the live shipboard concerts by Crosby, Stills and Nash in 2015, the songwriting workshops led by Chris Difford and other professional musicians in 2014 and the Transatlantic Fashion Week of 2016. Most of these events involve well-known personalities and give guests a glimpse into worlds not usually open to the public. Above: Ms. Haley standing in front of the video wall in Queen Mary 2's Royal Court Theatre.